Chickpeas. Garbanzo beans. Doesn't matter what you call them. In my opinion, they're nutritious and delicious. I'm a big fan and always have been. 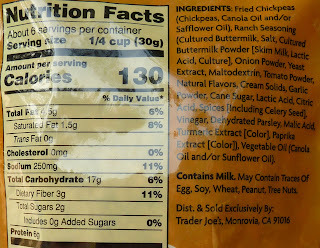 In fact, I put my love of chickpeas on display in a salad dressing review last year. I called my salad the "garbanzaganza." 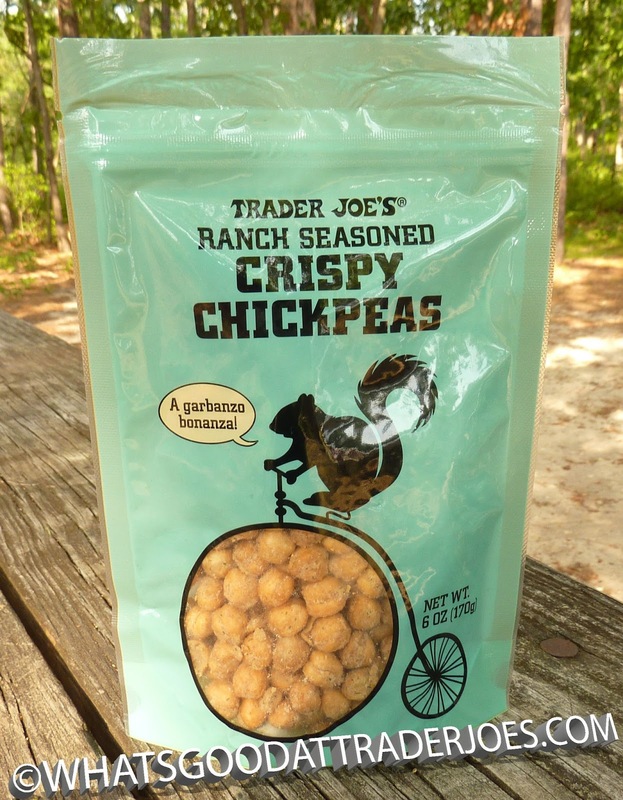 Interestingly, Trader Joe's calls this product "a garbanzo bonanza." I suppose you can and should make the distinction that my fictitious word is a mashup of "garbanzo" and "extravaganza," while TJ's uniquely employed the use of the word "bonanza" for this chickpea product. Therefore, this product shall henceforth be known as the "garbanzonanza" because I'm big into fictitious words, contractions, portmanteaus, and all manner of linguistic tomfoolery. Then I began to muse about the squirrel on the packaging. Wasn't aware squirrels were into garbanzos—or any beans for that matter. They're more into seeds and nuts. And that's why I think he's there: because this product has a distinctly nutty flavor. 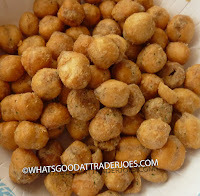 Plus, these chickpeas are indeed crispy like nuts, by virtue of them being fried and dried. Texture-wise, they're very similar to wasabi peas. 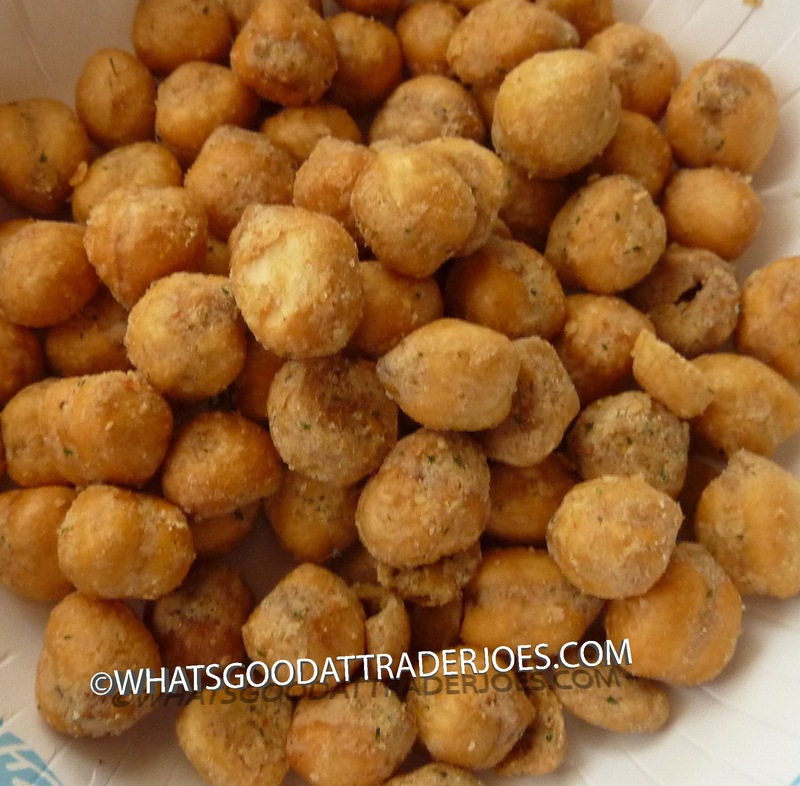 Flavor-wise, in addition to the aforementioned nuttiness, they're salty, savory, and do taste vaguely like normal garbanzo beans. They're "ranch seasoned," but honestly, they're not exactly bursting with ranch taste in my opinion. It's detectable, but it plays second fiddle to the natural taste of the beans, along with the other seasonings like onion and tomato powders. $2.99 a bag, a good bit of fat and sodium, but also rich with fiber. Sonia will go with four and a half stars, stating, "I really like them a lot." Me too. Four stars here. Very unique. Disagree with you on this one. 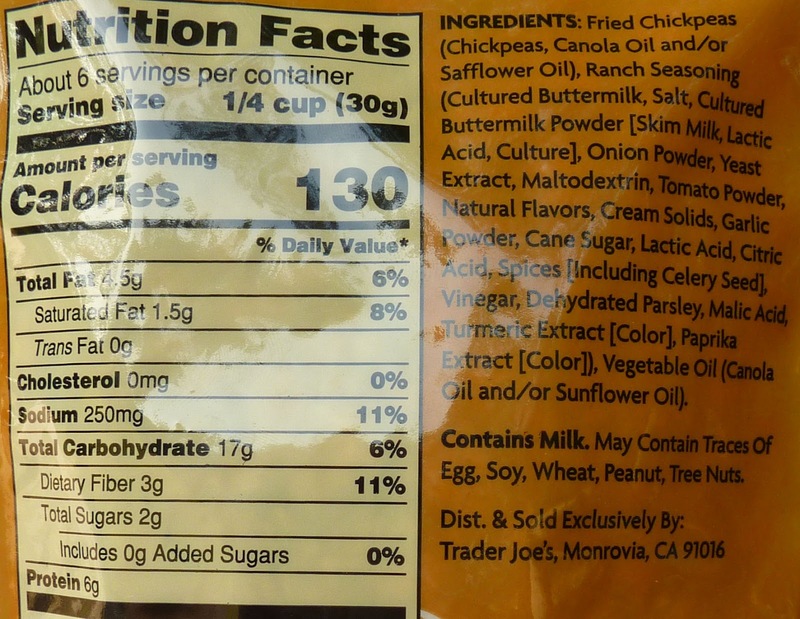 I bought these for a "healthy" snack, and while the ranch flavor was fine, I couldn't get over an awful texture and mouthfeel. They disintegrated but not in a pleasant, crispy way - no, it just coated my mouth in a chalky powder. Wonder if I just got a bad handful. I had the same experience. Really not good. So disappointing! The ones from Costco, on the other hand, are crispy, salty and delicious. 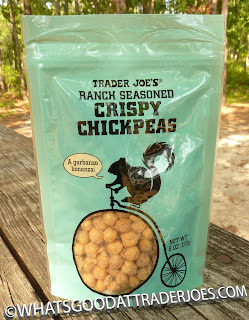 I wanted to try these but the store I go to stopped selling them because they weren't a big seller. Kinda disappointed. I bought these and let them sit a few weeks because I just wasn't sure if I'd like them. But I finally tried them and they are great!